Before I get to the bio information that I blatantly stole from her website, I have to tell you two things. One, Gayla’s answers sent me a Googling like a madwoman. I’ve learned a lot, which is awesome. Second, I think our own Ben will add about half of the books Gayla talks about to his “To Read” list. Now the biographical stuff: Gayla Marty grew up on a farm in east central Minnesota and studied journalism at the University of Minnesota, Twin Cities, including a year at the Universit? de Tunis in Tunisia, North Africa. She holds an M.F.A. in creative writing and has written many short articles, two plays, and readings for liturgy and worship. 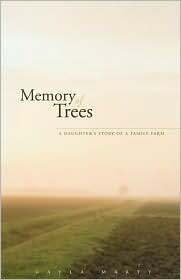 Her first book, Memory of Trees: A Daughter’s Story of a Family Farm, has been published by University of Minnesota Press, released in April 2010. She lives in Minneapolis and works as a writer and editor with an interest in culture, agriculture, and natural history. Finally, you should know that Gayla’s going to be reading at 7:30 p.m. Thursday (April 22) at Virginia Street Swedenborgian Church, 170 Virginia Street (it’s one block from Common Good Books). Right now, Native American Fiction: A User’s Manual by David Treuer, The Bullhead Queen by Sue Leaf (slowly, with the seasons), Survival of the Sickest by Sharon Moalem (evolutionary biology of disease), and Abraham by Bruce Feiler. And I just acquired another that I’m itching to open– Gathering Moss: A Natural and Cultural History of Mosses by Robin Wall Kimmer. I have adored lots of fictional girls and women, from Meg in A Wrinkle in Time, to Margaret in Howards End, to Christabel and Maud in Possession. But crushes–I can’t remember any! I think my crushes were historical characters. As a girl, I wore out volumes 11-13 in my Childcraft books–on patriots and artists and inventors like Paul Revere and Mozart and Sequoyah. As an adult, I might say Orlando, but even he (she?) was historical, according to the author. At least two of my favorite living authors are already here. But if I had to pick one favorite author of all time, it would be J, the Yahwist, ca. 900s BCE. I’d bring her–I do like to think it was a woman–to the Endless Bridge at the Guthrie Theater. There’s a place inside where we could get something to drink and then sit outside and watch the Mississippi. The Secret Garden. Mystery, romance, an enclosed garden, illness and healing, a big project, kids who were clever and determined and sneaky and good-hearted. The Names of Things by Susan Brind Morrow. I love that book. There’s something in it to sustain the spirit. The poetry and other writings of St. Ephrem of Syria (300s CE). I discovered him in Saving Paradise by Rita Nakashima Brock and Rebecca Ann Parker (2008). His work is an example of how the early Christian church focused on and sought to create paradise in this world. We need that, I need that. . . to tune ourselves to beauty at hand without shrinking from the dire need and daily tragedy that surrounds us. You’re right. I did add about half of them.